I've made pork belly 3 or 4 times now but always used the same recipe. I decided to try something a little different with my last pork belly. I found a recipe for honey pork belly on justonecookbook.com that looked good. Mine didn't look quite the same as what's on that site. I probably cooked it longer because I wanted to render out as much of the fat as I could. It was nice and crispy though, like bacon and I like bacon. The texture was similar to something like general tso's chicken. It was the first time I've ever tried glazing meat. After the pan cools, you're going to be left with a hard, crusty coating of sauce stuck to your pan. I thought it was going to be a real pain to clean but it wasn't so bad. Just add some water to the pan and put it on the stove. When the water gets hot enough the sauce will just melt for easy clean up. If you are gluten free, it may be difficult to find oyster and soy sauces that are gluten free but they do exist. If you can't find any, you can always buy it online. Wok Mei has an all natural gluten free oyster sauce. There are a lot more options for gluten free soy sauces. There's a whole list of them here on celiacdisease.about.com. 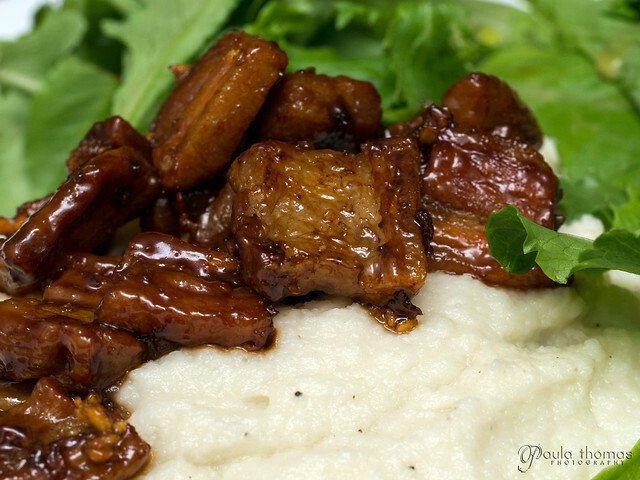 I decided to pair the pork belly with mashed cauliflower. I steamed the cauliflower, added a little sour cream and butter and added it all to a food processor with some salt & pepper. It made a nice creamy puree that almost tasted like mashed potatoes. I actually made the cauliflower first and made the pork belly while the potatoes sat in the oven. The photos in the last couple of blog posts were taken mostly with wide angle lenses. I just got the new Olympus 60mm macro lens and have been shooting with it a lot lately so all the photos below were taken with that lens. If you're a micro four thirds shooter and interested in finding out more about this lens you can watch my video review. Remove forets from head of cauliflower and wash. Steam cauliflower until soft, about 15 minutes. 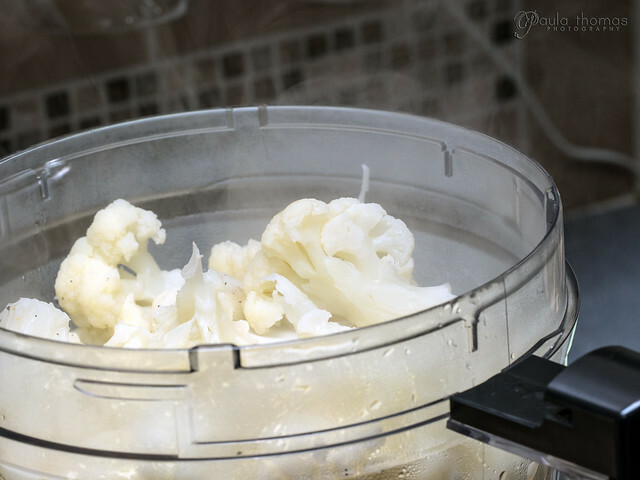 Add cauliflower, sour cream, butter, salt and pepper to a food processor and process until smooth. Add cauliflower puree to a casserole dish, cover and cook in a 375 degree oven for 20-30 minutes or until pork belly is done. 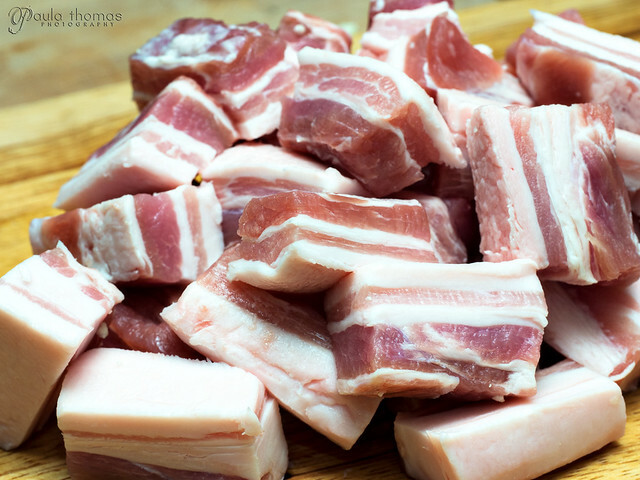 Slice pork belly into 1/4" pieces. Heat oil in skillet over medium-high heat. 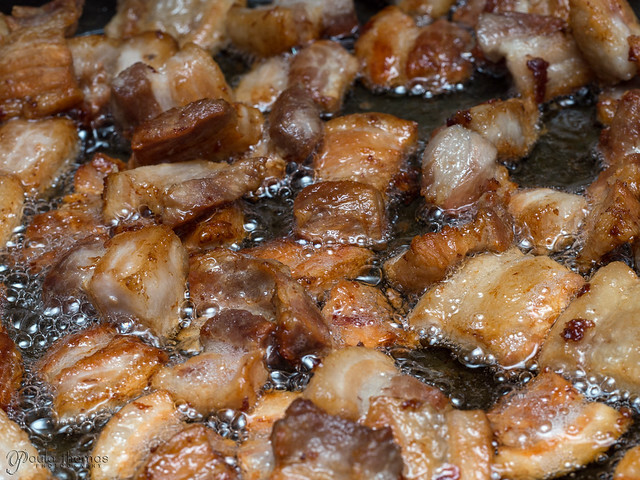 Add pork belly and render fat until pork is golden brown on both sides. Drain pork fat into a glass container and refrigerate for future use. Use a paper towel to soak up any excess oil from the pan. Turn heat back to medium and add the honey, soy sauce, oyster sauce and garlic to the pan. Stir sauce and pork together until well coated and cook for a couple of minutes to glaze being careful not to burn the sauce. Remove from heat and serve over a large spoonful of mashed cauliflower.